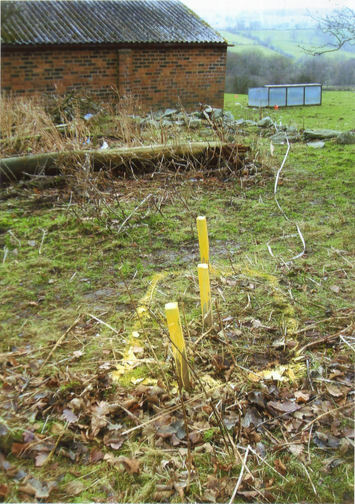 A water divining job in Llansilin in April 2009 proved interesting it was the last of three jobs in quick succession and all three properties were within a quarter of a mile of each other. The challenge was to find a reliable source of sweet (drinking) water for each client that did not interfere with their neighbours supply. Peter successfully identified three separate sources of water for the clients. 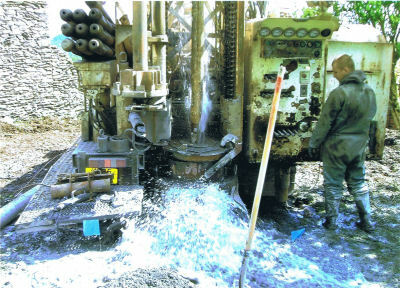 In these pictures we see the final of the three boreholes being drilled. Here Peter found a stream of sweet water at around 30 metres and the drillers were duly called. A few weeks later Peter received a panicked call from Llansilin - the drill had reached 30 metres and there was no sign of water. Puzzled, Peter donned his helmet, leapt onto his motorbike and through driving rain made his way to the site. 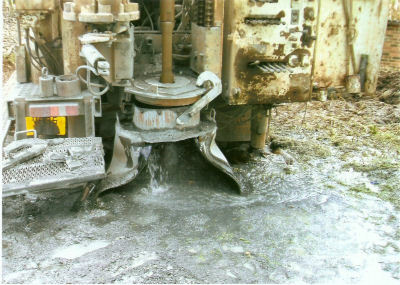 He was greeted by a relieved client - who told him they had drilled just a little further - to 35 metres and hit water. He led Peter to the drilling rig where water was gushing from the ground. By then the weather had cleared, and Peter was able to get these photographs of abundant water flowing from the ground. The depth count had been slightly out because of the presence of clay in the drilling area, this can sometimes make water appear not to be as deep as it really is. In the photo below you can see how accurately Peter marked where water would be found. The two blue flags one either side of the hole are the flags Peter uses to mark the edges of the underground stream - now you know what to look for, you'll be able to spot the flags in other photos across this website. Usually water takes a while to run clean, but when Peter left the site and hour later, the water was already running crystal clear. Did you ever wonder what a modern well looks like? Forget any ideas of buckets on ropes, picturesque brickwork or tiled roofs. 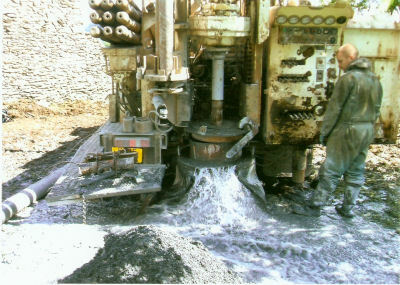 The truth is with a modern borehole once its is finished you barely know it's there. 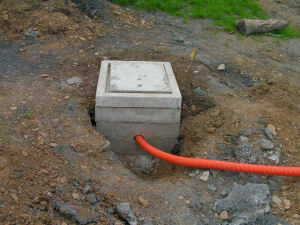 to this ... the finished manhole for the successfully drilled well.